Have a craving for great Mexican food? Then stop by Takos al Pastor in Plaza del Carmen right north of Puerta del Sol in Madrid. Takos is a small shop that seems similar to a taco-truck style service but with seating available inside. The main staple here is of course tacos! The tacos are made of soft shell corn tortilla and come in a few different varieties. These include different types of pork, chicken, potato and chorizo with cheese, mushrooms with cheese and even cactus with cheese, among others. The al pastor tacos are a must. These tacos are not just the best in Madrid but also the cheapest: one taco is 1€ each. Besides tacos, Takos offers other traditional Mexican dishes like quesadillas, queso fundido (melted cheese), alambres (grilled beef with various toppings) and tortas (sandwiches). They also serve typical Mexican beers and cocktails like margaritas and michelada (beer with lime juice and spices). When you arrive you will notice a line out the door, which I think is usually a good sign of the quality of the spot. Staff will take your order and you will be assigned a seat. Wait for your food, throw on some extra homemade spicy sauce (be careful, it’s hot!) 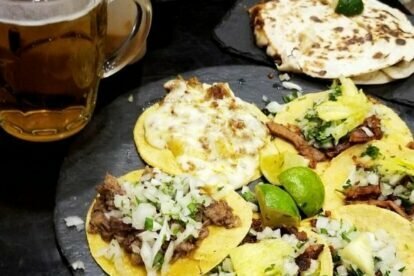 and enjoy the best tacos you will have in Madrid! Also, there are two locations for Takos al Pastor: one in Plaza del Carmen and one on Calle Botoneras by Plaza Mayor.